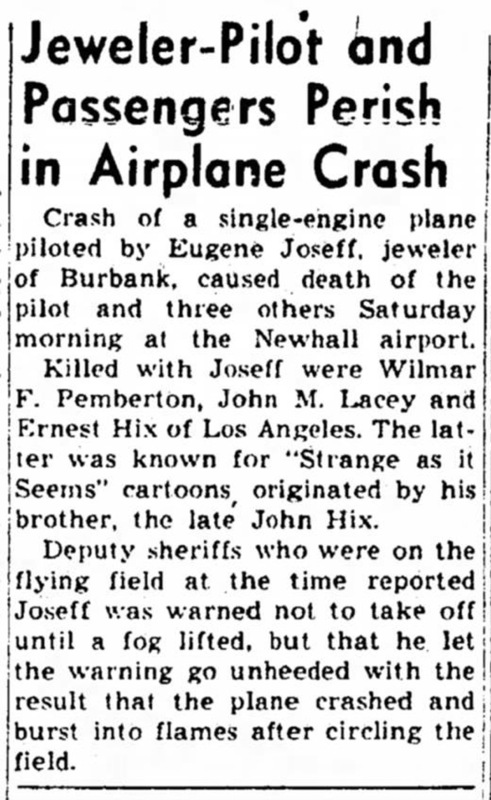 SCVHistory.com | Aircraft Down | 4 Including Movie Jeweler, Cartoonist Killed in Plane Crash at Newhall Airport, 1948. 4 Including Movie Jeweler, Cartoonist Killed in Plane Crash at Newhall Airport. Incident September 18, 1948 | News reports, September 1948. Click to enlarge. Ernest Hix looks over the shoulder of brother John Hix on Armistice Day (Nov. 11), 1932. In addition to making costume jewelry for the movies as Joseff of Hollywood, Eugene Joseff (b. Sept. 25, 1904) was the founder and president of Joseff Precision Metal Products, a maker of aircraft and missile parts. 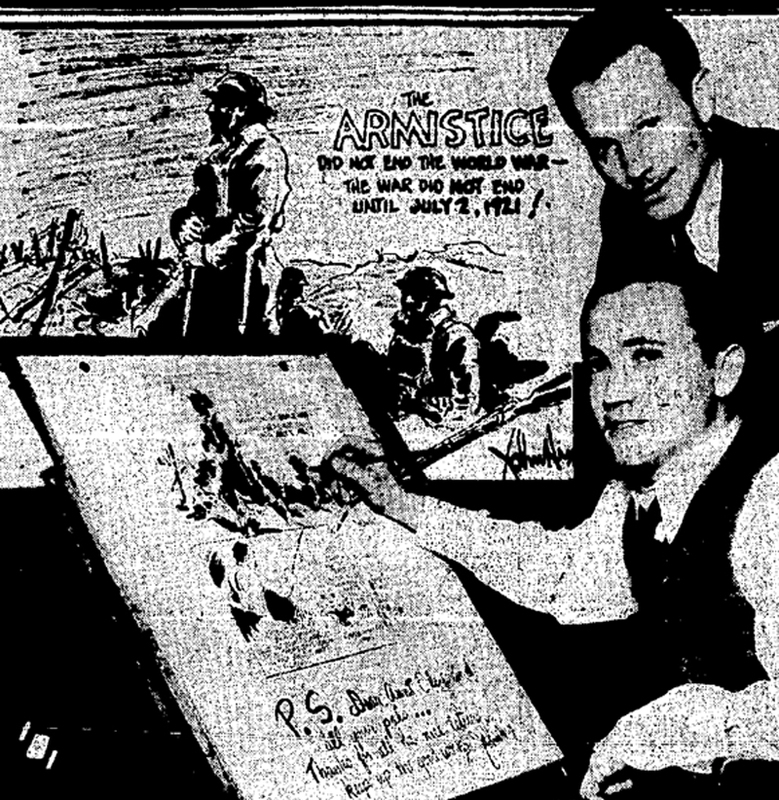 Ernest Hix produced (but didn't draw) the "Strange as It Seems" cartoon, which was distributed by United Features Syndicate. It competed head-to-head with "Ripley's Believe It Or Not!" (King Features Syndicate). Ernest Hix had taken over the strip from his brother, John Hix, who died of myocarditis on June 6, 1944 — which was D-Day, strange as it seems. The strip survived until 1970. 4 Die in Fall of Plane at Newhall. The Times (San Mateo, Calif.) | Saturday, September 18, 1948. 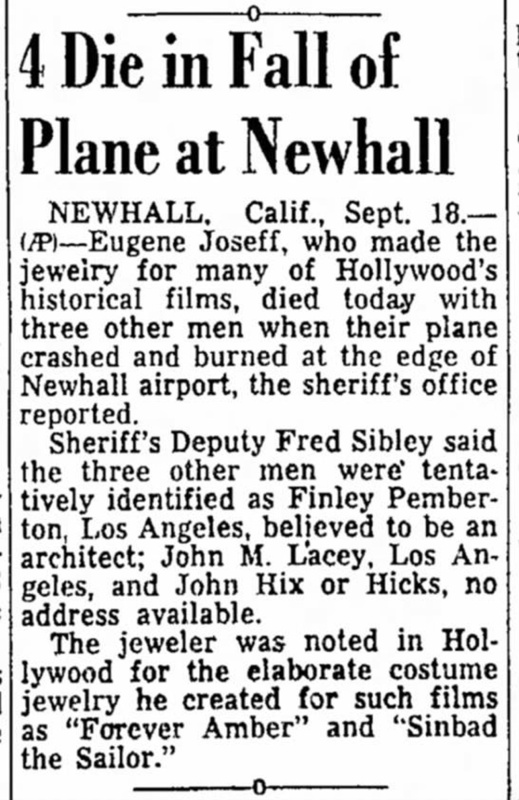 Newhall, Calif., Sept. 18 — (AP) — Eugene Joseff, who made the jewelry for many of Hollywood's historical films, died today with three other men when their plane crashed and burned at the edge of Newhall airport, the sheriff's office reported. Sheriff's Deputy Fred Sibley said the three other men were tentatively identified as Finley Pemberton, Los Angeles, believed to be an architect; John M. Lacey, Los Angeles, and John Hix or Hicks, no address available. The jeweler was noted in Hollywood for the elaborate costume jewelry he created for such films as "Forever Amber" and "Sinbad the Sailor." 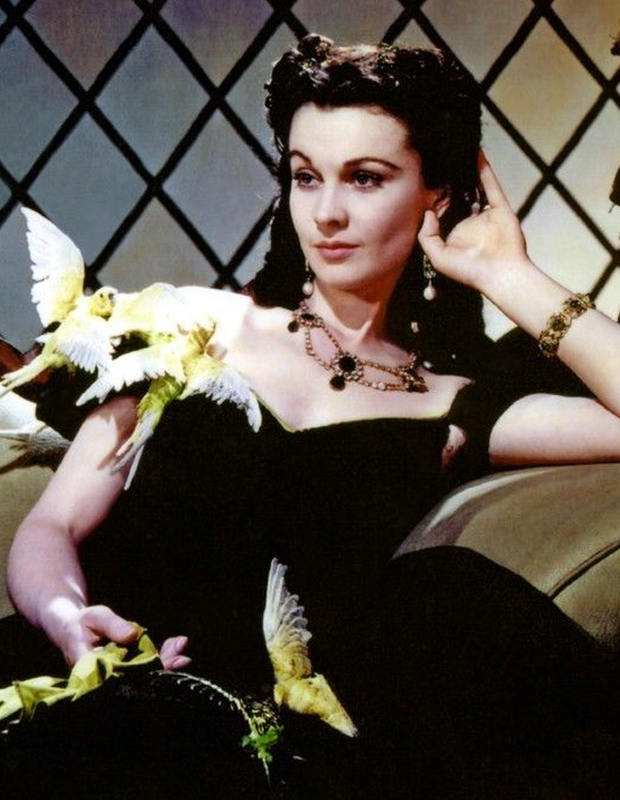 Vivien Leigh as Scarlett O'Hara in "Gone With the Wind" (1939). Necklace by Joseff of Hollywood. Hix, Cartoonist, 3 Others Killed. Long Beach Press-Telegram | Sunday, September 19, 1948. Newhall, Calif., Sept. 18. — (UP) — A private plane crashed in flames here today shortly after taking off, killing four men, including Ernest Hix, 41, Hollywood, author of United Features' cartoon, "Strange as it Seems." Hix was the brother of the late John Hix, originator of the cartoon, and took over production of the panel after his brother died. 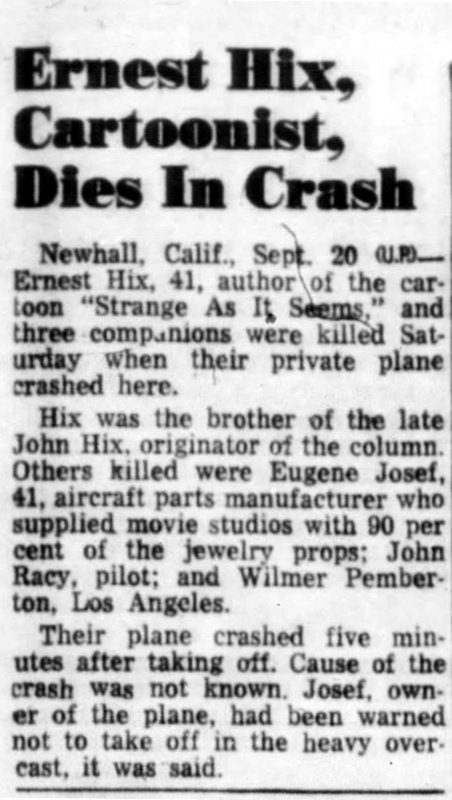 Dead with Hix are Eugene Joseff, 41, maker of much of the ornate jewelry used in motion pictures; John M. Lacey, Los Angeles, and Wilmer F. Pemberton, Los Angeles, a designer. Joseff supplied motion pictures with 90 per cent of their jewelry props. He rented out his collection of 50,000 precious, semi-precious and artificial stones and could duplicate historically famous jewelry in mass production. Joseff's widow is Joan Castle, sister of W.F. Castle, 4715 Gundry Ave., Long Beach. She uses her maiden name for a line of costume jewelry in which business she has been affiliated with her husband. Castle said yesterday that his sister and the Joseff baby, Jeffrey, had been making weekend plane trips regularly with Joseff, and he did not know why they were not along on the fatal trip. Fog Is Blamed For Fatal Newhall Crash. The Fresno Bee-Republican | Monday, September 20, 1948. 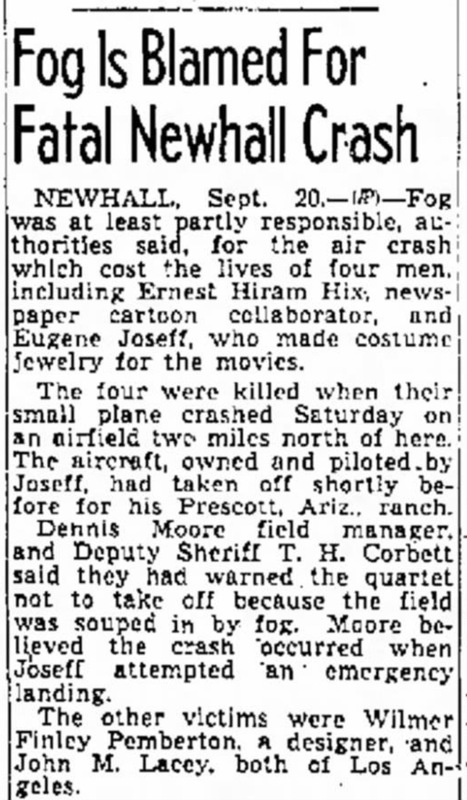 Newhall, Sept. 20 — (AP) — Fog was at least partially responsible, authorities said, for the air crash which cost the lives of four men, including Ernest Hiram Hix, newspaper cartoon collaborator, and Eugene Joseff, who made costume jewelry for the movies. The four were killed when their small plane crashed Saturday on an airfield two miles north of here. The aircraft, owned and piloted by Joseff, had taken off shortly before for his Prescott, Ariz., ranch. Dennis Moore field manager, and Deputy Sheriff T.H. Corbett, said they had warned the quartet not to take off because the field was souped in by fog. Moore believed the crash occurred when Joseff attempted an emergency landing. The other victims were Wilmer Finley Pemberton, a designer, and John M. Lacey, both of Los Angeles. Jeweler-Pilot and Passengers Perish in Airplane Crash. Van Nuys News | Monday, September 20, 1948. Crash of a single-engine plane piloted by Eugene Joseff, jeweler of Burbank, caused death of the pilot and three others Saturday morning at the Newhall Airport. Killed with Joseff were Wilmar F. Pemberton, John M. Lacey and Ernest Hix of Los Angeles. The latter was known for "Strange as it Seems" cartoons, originated by his brother, the late John Hix. Deputy sheriffs who were on the flying field at the time reported Joseff was warned not to take off until a fog lifted, but that he let the warning go unheeded with the result that the plane crashed and burst into flames after cycling the field. Ernest Hix, Cartoonist, Dies in Crash. Santa Cruz Sentinel | Monday, September 20, 1948. Newhall, Calif., Sept. 20 (UP) — Ernest Hix, 41, author of the cartoon "Strange As It Seems," and three companions were killed Saturday when their private plane crashed here. Hix was the brother of the late John Hix, originator of the column. Others killed were Eugene Josef, 41, aircraft parts manufacturer who supplied movie studios with 90 percent of the jewelry props; John Racy, pilot; and Wilmer Pemberton, Los Angeles. Their plane crashed five minutes after taking off. Cause of the crash was not known. Josef, owner of the plane, had been warned not to take off in the heavy overcast, it was said. Probe of Holocaust at Airport is Undertaken by Inspectors of C.A.A. A pathetic pile of twisted, burned airplane wreckage, lying along the east border of the Newhall Airport this week, is still a mute reminder of the ghastly accident Saturday morning which burned four human beings alive. Investigators of the CA.A. completed their inspection Monday, and departed with no hint of what their analysis might be. It will not be announced for several weeks. In Burbank, Hollywood and Los Angeles, the charred, blackened remains of the victims were laid to rest. They were victims of the valley's first heavy fog of the year, and the over-confidence of an amateur pilot who disregarded the advice of experts. As he had done many times previously, Eugene Joseff, age 38, wealthy Burbank jeweler, brought his four place Beechcraft Bonanza airplane to the Newhall field Friday evening. He did this to avoid the heavy morning fogs of the San Fernando Valley when he wanted to make an early start on Saturday. With his friends, Ernest H. Hix, 46, and John H. Lacey, age 65, of Hollywood and Wilmar F. Pemberton, age 39, of Los Angeles, Joseff had planned a trip to Prescott, Ariz., where he was building a new ranch house. After parking the plane on the local field Joseff returned to Burbank. Saturday morning Mrs. Joseff drove the party of four to Newhall for the takeoff. But Saturday morning the weather man also rolled one of his infrequent heavy fogs into the Little Santa Clara Valley. The quartet went ahead with preparations for the flight. At 9:26 the ceiling lifted to 400 feet with ground visibility at about one mile. The big, low wing plane was untied and baggage stowed. Joseff announced his intention to get going. Dennis Moore, field manager for the Propert-Devine Corporation which leases and operates the field, did not like the looks of things. He sought to dissuade Joseff from taking off. C.A.A. communicator Maddox pointed out that the mist would clear away in another half hour or so, and all would be safe. He knew also that while the plane had instruments, Joseff was not trained in their use and might get into trouble with blind flying. Communications man J.C. Maddox of the C.A.A. station backed up Moore. Joseff would not pay much attention to the weather warnings. The ground men then tried another tack. They pointed out that one of the tires on the plane's landing gear had been losing air during the night and would probably be completely deflated by the time the ship reached Prescott. Joseff shrugged off this information, too, with the reported remark that he could make a landing on one wheel. Thus, against the advice of Moore and Maddox, Joseff went ahead with his preparations for departure. Lacey and Hix got into the plane and occupied the two back seats. Joseff took the pilot place and Pemberton sat beside him. Towards 9:40, the plane taxied out and turned north for the takeoff. At about that time, too, Deputy Sheriff John Parnell, who helps out at the airfield in his spare time, was coming down north Newhall avenue in the Sheriff prowl car with Deputy Corbett. They watched the Bonanza. Parnell says the plane took the air in a northerly course and then bore off to the left or west, disappearing in the overcast. The deputies could near the engine but could not see the plane. It seemed to be circling about to the south. Momentarily they lost the sound of the motor. Then in a moment, abruptly and apparently to the east somewhere over Placenta Canyon, the full throated roar of the engine came through the mist. It was running wide open. The roar continued, coming closer. Before the anxious eyes of watchers the plane appeared, plunging down through the overcast at a 45 degree angle toward the field, at full throttle. As it came in the clear the pilot apparently yanked back on the stick, for now the plane started to rise. Several hundred feet above the ground it went into a power stall, hung a moment, then fell away toward the east on one wing. Plunging groundward again at a 45 degree angle, it righted itself, then pancaked on the field a few feet from the east fence, almost directly opposite the C.A.A. station. Immediately it burst into flames and, flaming, bounced through the fence about 60 feet into the adjoining field where cantaloupes were being harvested. Flaming, it came to a rest. In the C.A.A. station, Maddox immediately called sheriff station, fire station and ambulance, in that order. Parnell and Corbett started across the field toward the burning plane. They realized they were helpless to do anything. A big county pumper appeared in less than five minutes in charge of Oliver Taylor with firemen Jerry Fryer and Al Rogers. The pumper rushed across the field. When the firemen got to the scene the plane was still intact. Fuselage and cockpit were still all together, although full of swirling flames. Fire from leaking gasoline was also rising from the ground all around the shop. No signs of life could be seen, and the firemen did not know there was anybody in the plane. Hastily they got long applicators and fog nozzles into play. They had to extinguish the flames arising from the ground before they could get the applicators into the now crumbling body of the plane. Gradually they got the fire in the plane under control. Then, and only then, as the spray from the nozzles washed away smoke and ashes, did their eyes fall upon the horrifying and ghastly spectacle. Like inert, blackened dummies in the forms of the occupants came into view. Joseff’s body was in the pilot’s seat. Beside him. But thrust backward and then slightly outward, lay the charred corpse of Pemberton. Crammed behind them were the corpses of Lacey and Hix, also burned almost out of human semblance, but sill in their seats with charred safety belts around them. From the streaming wreckage arose a sickening, sweetish stench of roasted human flesh which, once encountered, is never erased from memory. Capt. Ambrose Stewart arrived at the scene soon after the pumper and, a little later, Ed Hillburn. Knots of spectators began to gather, staring with fascinated horror at the grizzly spectacle. The Signal cameraman, on the scene early, shot out all of his negatives and had to retire, nauseated, from the scene. From all appearances, all of the plane’s occupants had died where they sat and almost immediately. Their watches had stopped at 9:47. After the work of removal started it was observed that all of the victims had sustained compound fractures of legs and arms. As observers reconstructed the holocaust, the impact of the landing thrust the wheel struts straight upward and through the wing tanks, which were full of high test aviation gas. The red hot exhaust pipe added the ignition factor. The gas not only flowed into the fuselage around the plane’s occupants but out on the ground about the ship. From the position of Pemberton’s remains it is surmised that he alone, of the four, may have been alive as the flames started and made some sort of effort to escape. As soon as the debris cooled down somewhat the work of removing the corpses was started under the direction of Mr. Hilburn. A lady photographer hurried to the scene from Montrose and got some pictures for the Los Angeles Times. The Examiner men did not arrive until the bodies were removed, but got some pictures of the bodies lying on the ground. Both papers gave the story a first page play. The CACOM states that the C.A.A. communication station offers flight information service, including weather observations and forecasts, to pilots but does not have any control over their actions. Of the four victims, Joseff and Hix were men of some prominence. Joseff was a noted man in the jewelry trade, having created and executed designs for many big people in the movie world. Hix was the owner of a newspaper syndicated cartoon feature, created by his late brother, John Hix. The plane in which they met their deaths is reported to have cost the owner $11,000. After the C.A.A. inspectors had completed their work, the pieces of the ill-fated ship were taking from the melon field and placed just inside the fence line of the airport.